Chinook Ski Boot Dryers Drying Systems for non heat drying for commercial and residential drying solutions. Chinook B200 ski boot dryers can dry your ski boots, snowboard boots, work boots, ice skates, hockey skates, work boots, sneakers and gloves overnight. 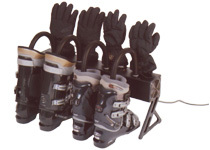 Chinook Boot Ski Boot Drying products are designed to dry all types of foot ware and gloves. Garments are dried by forcing room temperature air through your boots and gloves creating constant circulation and evaporation. Chinook Ski Boot Dryers come with a lifetime warrantee from the manufacturer and use 115v AC. 10% Off P100 Chinook Boot Dryers for a Limited Time. Buy Today and SAVE! Drying Method:	Dries by forcing room temperature air through the garments for overnight drying. · Chinook boot dryers are for watermen like boaters, fishermen, captains, divers, ferry workers, etc. Wet boots get cold and damp from moisture buildup. By using a boot dryer and removing the moisture, your feet will feel warm and dry. · To reduce the amount you feet and shoes smell, don't wear the same shoes everyday - give a pair of shoes 24 hours or more to air out before wearing them again. · Chinook boot dryers are for skaters like ice hockey skaters, figure skaters, speed skaters, roller blade skaters, etc. Wet boots get cold and damp from moisture buildup. By using a boot dryer and removing the moisture, your feet will feel warm and dry. · To eliminate foot odor, practice good foot hygiene to keep bacteria levels at a minimum. Check for fungal infections between your toes and on the bottoms of your feet. If you spot redness or dry, patchy skin on your feet, get treatment right away. · To prevent your shoes from smelling, you could wear footwear that can circulate air like (sandals or open toe shoes). · To reduce the amount of sweat that collects in your shoes, you should wear well-ventilated shoes instead of very constrictive shoes, such as boots. · Chinook boot dryers keep your footwear dry. Dry footwear prevents fungus that causes shoes and boots to smell. Also, dry footwear will keep your feet warm and healthier. · Chinook boot dryers are for athletes who play soccer, football, baseball, lacrosse, etc. Wet boots get cold and damp from moisture buildup. By using a boot dryer and removing the moisture, your feet will feel warm and dry. · Chinook boot dryers are for athletes who play soccer, football, baseball, lacrosse, etc. Wet cleats get cold and damp from moisture buildup. By using a boot dryer and removing the moisture, your feet will feel warm and dry. · Fungus grows in your shoes, gloves and boots because it's moist and dark. The fungus will continue to grow, smell and live in your shoes or boots until the moisture is removed. Boot dryers eliminate the moisture and thereby killing the fungus. You're left with warm, clean, odor-free, moisture-free, warm boots, gloves and shoes. · Built-up moisture in your shoes and boots can contribute to athlete's foot. · Fungus grows in your shoes, gloves and boots because it's moist and dark. The fungus will continue to grow, smell and live in your shoes or boots until the moisture is removed. Cyclone Kwik boot dryers eliminate the moisture and thereby killing the fungus. You're left with warm, clean, odor-free, moisture-free, warm boots, gloves and shoes. · Chinook boot dryers help to reduce the amount you feet and shoes smell, don't wear the same shoes everyday - give a pair of shoes 24 hours or more to air out before wearing them again. · To eliminate foot odor, wash your feet with anti-bacteria soap and use hot water to wash your socks. · Chinook boot dryers are for anyone who works outdoors like construction workers, department of transportation workers, farmers, builders, policemen, fireman, flagmen etc. Wet boots get cold and damp from moisture buildup. By using a boot dryer and removing the moisture, your feet will feel warm and dry. · Chinook boot dryers are for kids who ski, play in the snow, jump in puddles, etc. Wet boots get cold and damp from moisture buildup. By using a boot dryer and removing the moisture, your feet will feel warm and dry. · Where does that smell come from? The smell comes from waste being produced from the bacteria eating our sweat. As the bacteria on our feet or underarms eat our sweat, they excrete waste that has a strong odor.